This paper studies the possibilities to support participatory design processes with persuasive technologies. Drawing on extant work by Elizabeth Sanders, it introduces a comprehensive framework for participatory design which highlights challenges for collaborative attitudes and behavior. 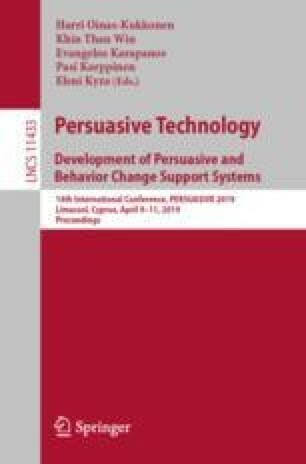 To see how persuasive technologies can answer these challenges, the paper reviews the proceedings of the PERSUASIVE conferences since 2010. It identifies 186 application cases, which can be related to twelve different technology platforms. Following a design science research approach, the paper introduces an online navigator to explore different scenarios to support participatory design processes resulting from the findings of the literature review. The navigator can be applied together with Fogg’s eight-step design process for creating persuasive technology. To evaluate the navigator, two artificial evaluation iterations are conducted: ex ante a criteria-based analysis to show its theoretical efficacy and ex post problem-centered interviews with experts to gain further insights. The results contribute to a better understanding of the role that persuasive technologies can play in participatory design activities.